The Full Kit™ is all the diapers you’ll need to cloth diaper your baby full time from birth to potty training. 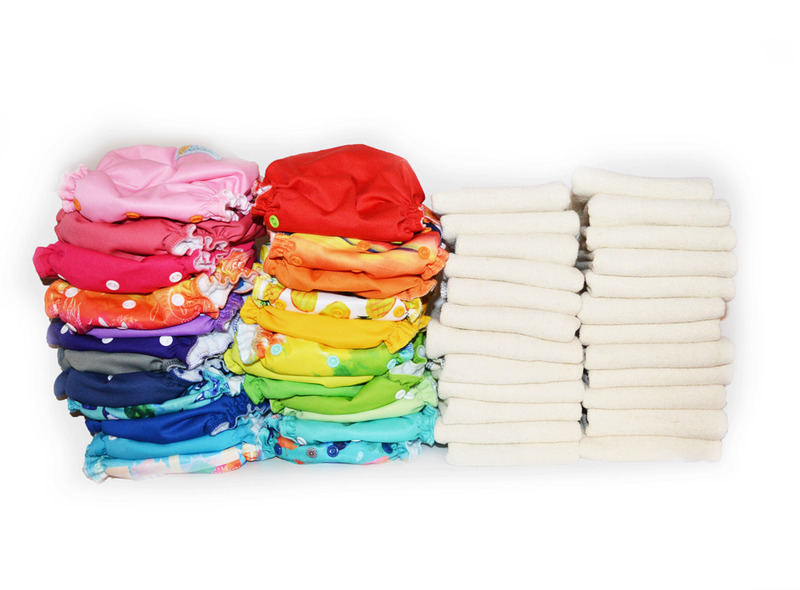 24 One size Easy Pocket ™ diapers, and 24 one size trifolds. Meet the most versatile diaper in our lineup and best selling, Easy Pocket™. The Easy Pocket™ is known and loved for it’s perfect fit, soft stretchy fabric, and adorable look. Designed to give you the best value, the Easy Pocket™ diaper will fit your baby from 6lbs up to 40lbs, and has the warranty to get you there. Our premium quality fabric stretches and moves with your baby and the gentle elastics won’t leave harsh marks on sensitive skin. We know all babies are built differently, which is why we make our diapers with a double row of snaps on the wings and tummy, allowing you to adjust the tightness to match your baby’s shape and size. The contoured shape of the Easy Pocket™ gives your baby a more natural fit, and doesn’t add bulk between the legs, making moving, playing, and restful sleeping a breeze. A waterproof outer shell keeps both baby and caregiver dry, and a soft fleecy inside insures sensitive skin is protected against rash-causing wetness. The inner pocket opening allows for easy stuffing and for inserts to agitate out of most washing machines on their own. The Easy Pocket™ bundle includes 1 of our premium trifolds. Inner wetness channels, leg elastics, and a gentle band in the back help keep messes inside where they belong- meaning fewer outfit changes, and less laundry than with disposable diapers*. Our Easy Pocket™ diapers are designed in Stanley, New Brunswick and Made in Canada by our professional team, using only premium imported as well as domestic materials.